IBM® Tivoli® Storage Productivity Center is a storage infrastructure management software product that can centralize, automate, and simplify the management of complex and heterogeneous storage environments. 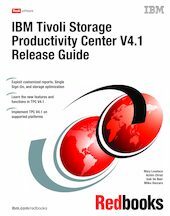 This IBM Redbooks® publication is intended for administrators or users who are installing and using IBM Tivoli Storage Productivity Center and IBM Tivoli Storage Productivity Center for Replication. It describes the hardware and software requirements for installing the products and provides an overview of the installation procedures. The new features and functions introduced in this version are also covered, as well as working scenarios showing how to take advantage of the product.